Unless you’re living under the rock, you would be aware of Bharat star Salman Khan‘s obsession for his nephew and Arpita Khan Sharma and Aayush Sharma‘s son, Ahil. While the social media keeps flooding with pictures and videos of the uncle-nephew camaraderie, the latest ones from Ahil’s third birthday celebrations at Panvel farmhouse have set fans on a frenzy. 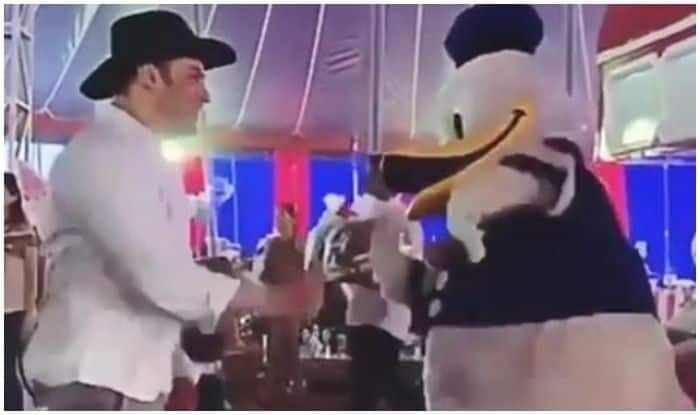 In one of the viral videos, Salman can be seen doing the floss dance with life-sized Winnie The Pooh, Tigger and Donald Duck mascots at the bash. Donning a cool look comprising of t-shirt, shorts, white shirt and a hat, the superstar danced his heart out. Another video featured a massive cake with toy superheroes on it as Aayush blew the candle and Arpita held out the knife to help cute the cake. The little kiddo is the youngest member in the Khan-Sharma family and no wonder he is the most pampered. Whenever maamu (maternal uncle) Salman Khan is in town and has some free time, he loves to spend it playing with Ahil. The two share a great bond and Arpita keeps sharing some cute clips and pictures to make our hearts roll. We cannot ever have enough of these cuties. On the professional front, Salman Khan-produced film, Notebook, starring debutant Zaheer Iqbal and Pranutan Bahl recently hit the cinema screens and is performing well so far. Salman, on the other hand, will be next seen in Bharat opposite Katrina Kaif.